Created and directed by Paul Greengrass, 22 July is the harrowing account of Norway's worst terrorist attack in which seventy seven, mostly teenagers, were killed. A remarkable film that follows events through the massacre and subsequent trial of terrorist Anders Breivik. 22 July is Netflix Film about the 2011 Norway attacks and the aftermath. It is based on the book One of Us by Åsne Seierstad. The film was written, directed and co-produced by Paul Greengrass who also created United 93. Set in Norway, 22 July features a Norwegian cast and crew but was filmed in English, I'm assuming so it would have a wider audience reach. 22 July is the harrowing account of Norway's worst terrorist attack in which seventy seven, mostly teenagers, were killed. 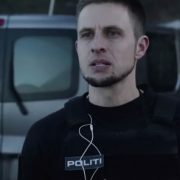 The atrocity, committed by right-wing terrorist Anders Breivik, took place in Oslo and Utoya Island and this movie covers the events of the day and the months that followed as Breivik went to trial. As the camera pans across the vast Norwegian landscape we get our first introduction to Breivik. It is the day before the tragic event and his plans are well under way. The scene quickly changes to a group of happy smiling teenagers on their way to a camp on Utoya Island. Back to Breivik as he double checks his weapons. Within eight minutes of the film it's 22 July and Breivik has set off a bomb in Oslo in the Government district. As the emergency crews rush to the devastating scene, Breivik is already on his way to the island. What follows is an almost indescribable level of psychological horror. It is cold, calculating and clinical. Breivik, dressed as a police officer, shoots his way through the island forest with exacting precision. The film then follows the story through his arrest and trial and it's impact on the survivors, in particular on Viljar Hanssen, who was shot three times but survived. As the legal drama unfolds, it's not a matter of guilty or innocent, everybody knows he did it. Breivik wants to be proved sane. 22 July is an incredible film that gives the events in Norway real gravity. Yes it is difficult to watch but Greengrass did a superb job of focusing on the process and the events themselves. The movie is gripping and engaging but has real restraint especially with when it comes to the lunacy of Breivik. Profoundly emotional, 22 July takes you to exactly where you don’t want to be and that's what makes it remarkable.